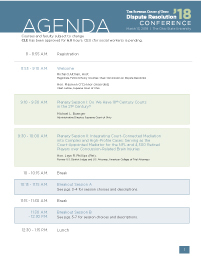 The 2018 Dispute Resolution Conference offers national speakers and numerous breakout sessions on a wide range of topics pertinent to developing exceptional skills, innovative techniques, and integrating dispute resolution processes and programs into today’s courts. This is a forum for those who share the common goal of improving the public’s experience with the legal system and the quality of services offered to disputing individuals. It serves the court’s goals to provide the public with fair, impartial, and speedy resolution of disputes without unnecessary delay. This event is open to Ohio judges, magistrates, attorneys, public officials, mediators, dispute resolution professionals, court administrators, and supervisors. Approval has been requested for CLE and CEU credit (approval pending). Registration is $50. The deadline to register is Tuesday, Feb. 27, 2018. Cancellations must be made by email to Kevin.Lottes@sc.ohio.gov no later than Feb. 27, 2018.